Low-profile conveyors serve key roles in production and assembly of all sorts of metal products. 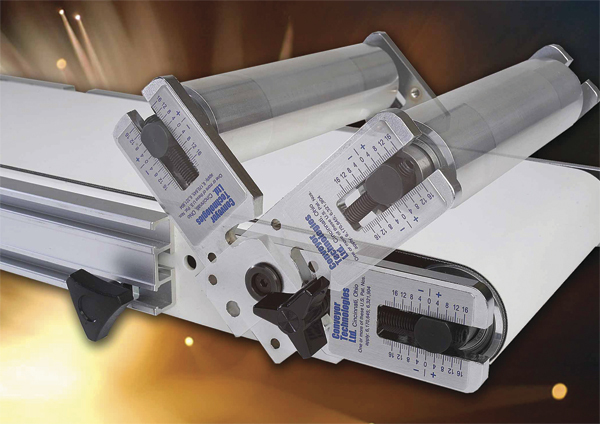 Broadly speaking, we’re talking about compact belt conveyors with 1- or 2-in. pulley diameters and maximum belt widths of 24 in. Typically used in 24/7 applications in packaging, assembly, labeling, inspection and sorting, low-profile conveyors form critical production links where unplanned downtime or time-consuming maintenance is intolerable. Upstream equipment continues to churn out product, so line stoppages, planned or unplanned, must be minimized. A conveyor featuring a tool-less swing-up tail pulley enables 1-min. belt exchanges while retaining the tension setting. Certainly the most critical areas of low-profile conveyors that draw maintenance attention are the belt and the pulley/bearing system. Speed, load, accumulation and inclined operation increase forces on these components, as well as on the drive system, highlighting problem areas such as belt tension. Belt manufacturers universally cite correct belt tension and crowned pulleys as keys to long belt life and consistent slip-free performance with positive self tracking. Incorrect belt tension causes a high percentage of component-related failures and maintenance issues. Whether over- or under-tensioned, incorrect belt tension can cause a variety of problems, including bearing overload, mis-tracking, belt slippage and accelerated component deterioration. 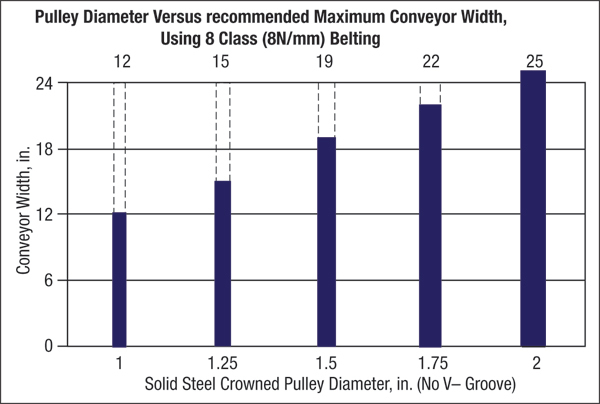 Correct tension varies, but typically it’s recommended to be 1 mm of belt stretch per foot of conveyor length. However, with allowable manufacturing tolerances on belts, a belt will normally be a little longer or shorter than its stated size. To ensure correct tensioning, a simple technique has been developed to allow maintenance people and even novice operators to set correct tension in a matter of seconds. The technique uses the tail pulley to set tension. Once all belt slack is taken up, the operator sets tension via a scale on each side of the conveyor, where each increment represents the tension setting per foot of conveyor length. It seems counterintuitive, but an under-tensioned belt can actually elongate in use, which can lead to a manufacturer discarding belts that actuality are in good condition, due to a conveyor’s limited tensioning capacity. Again, following the recommendations of the world’s major belt manufacturers, a crowned pulley with a correctly tensioned belt is the preferred to achieve automatic belt centering. A crowned pulley produces dual, lateral opposing belt forces, which balance each other with the belt centered over the crown. If the belt moves off center, these lateral opposing forces become unbalanced, resulting in the side with the higher force directing the belt back to its centered position. This action provides virtually wear-free centering. Crowned pulley systems also allow higher belt accelerations and speeds with less belt and component wear. Properly tensioned belts on crowned pulleys easily withstand moderate short-term lateral forces without major displacement from center. When side loads increase, manufacturers can add a V-retainer on the underside of the belt to limit off-center drift. The V-shaped profile rides in a groove cut into the pulleys (which reduces pulley rigidity), and a groove running the length of the conveyor bed. This approach allows the crowned pulley to quickly center the belt when the external force is removed, minimizing V-retainer wear. Belt manufactures recommend that V-retainers not be the primary belt-tracking system, due to the high wear incurred by the V-profile. If lateral force is sufficient, the V-retainer will climb out of its groove, possibly damaging the belt. An alternative is to use the V-retainer on the top edge surface of the belt, guided and constrained from the top down by a rolling Delrin V-guide located opposite the point where the belt experiences side forces. These guides keep the V-profile fully constrained, with reduced wear. A normal V-retainer alone offers no true noncontact guiding, so it tends to drag against the sides of the groove and constantly wear. Another point to consider on a bottom-mounted V-retainer: The weld used to attach the retainer results in a slight high spot in the middle of the belt. This can be troublesome if the belt carries small products prone to tip-over. Because of material incompatibilities, the V-profile cannot be used with certain belt types, such as silicon-based, Teflon and polypropylene belts. While low-profile conveyor pulleys typically range from 1- to 2-in. dia., this small range can produce a surprising difference in conveyor capacity and performance, as well as belt, cleat and bearing life. Smaller-diameter pulleys may be needed for applications requiring a minimum height profile where speeds and loads are moderate. However, logic dictates that a smaller-diameter drive pulley will have a much greater tendency to deflect as conveyor width increases. For example, a 1.25-in.dia. pulley without a V-groove will deflect nearly five times more than a 1.86-in.-dia. pulley with the same load. This creates an inherent traction disadvantage for load-carrying purposes, and can negate the crowning effect (belt-centering capability) of the pulley. This is highly problematic in applications that involve reversing, or those with wider conveyors or in accumulating or inclined setups. Flexing a belt over a smaller diameter also accelerates breakdown of the belt structure, leading to erratic operation and shorter life. When scaled up in width, conveyors with small-diameter pulleys often cannot carry proportionally greater loads. For example, a conveyor with a pulley diameter of approximately 2 in., with a correctly tensioned belt, will carry twice the load at a 24-in. width that it will at a 12-in. width. This rule of thumb does not hold as pulley diameters approach the 1.25-in. range. Smaller pulley diameters—with their greater tendency to deflect—have limited ability to produce the proper belt tension needed to achieve automatic centering with a crowned pulley. The resulting loss of traction and self-centering can be compensated for by lagging or knurling the pulley, and substituting a longitudinal V-retainer for belt centering in place of a crowned pulley. Because the knurled pulley must now have a V-groove in its center, its rigidity is further compromised. Belt manufacturers, too, discourage knurled pulleys because they invariably abrade the belt underside and resist tracking, which substantially reduces belt life. Further, impacted debris in the pulley knurl, or worn knurling, can lead to belt slippage and mistracking, as well as accelerated belt, V-retainer and pulley knurl wear. Bearing life also is greatly affected by pulley diameter. A 1-in.-dia. pulley must run at twice the RPM of a 2-in.-dia. pulley to produce an identical belt speed. Small pulley diameters can result in smaller bearings with lower load capacity running at higher speeds, reducing service life. Ensuring that the bearing outer race cannot rotate in the bearing-plate housing can improve bearing performance and avoid the need to replace worn bearing housings. Drives are available in a variety of styles. One style gaining in popularity is the external shaft mounted design. This unit is compact, provides perfect alignment and eliminates all couplings, drive belts, chain, sprockets, guards and tensioning. These drives can be radially positioned in 30-deg. increments.